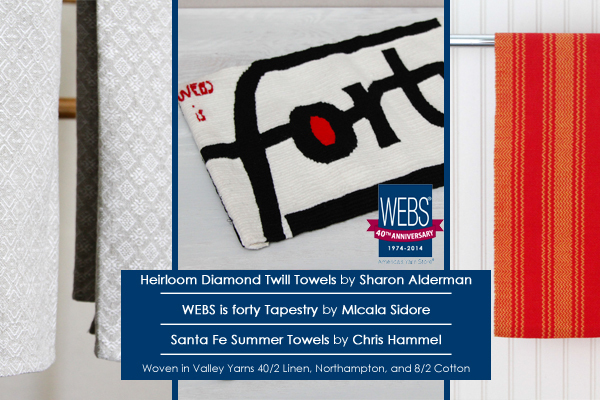 You have just 3 days left to fill your cart at WEBS Annual Year End Blowout Sale! Orders can be placed online until 11:59pm EST Saturday. Our retail store is closed today but will be open 10-5:30 tomorrow and Saturday. 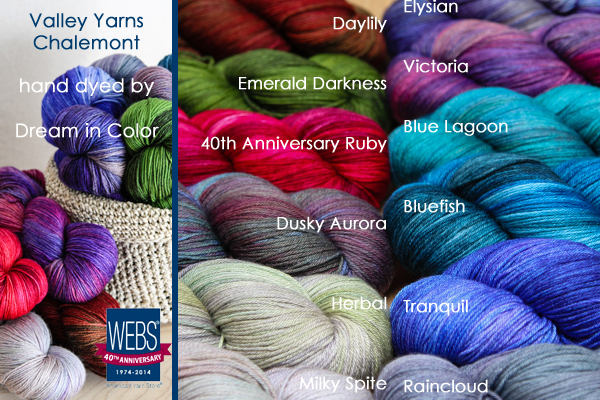 We still have multiple colors of our 40th Anniversary Huntington hand dyed by Lorna’s Laces and our Northfield hand dyed by Malabrigo. Don’t miss your chance to stash some Kettle Dyed Charlemont once it’s gone it’s gone! 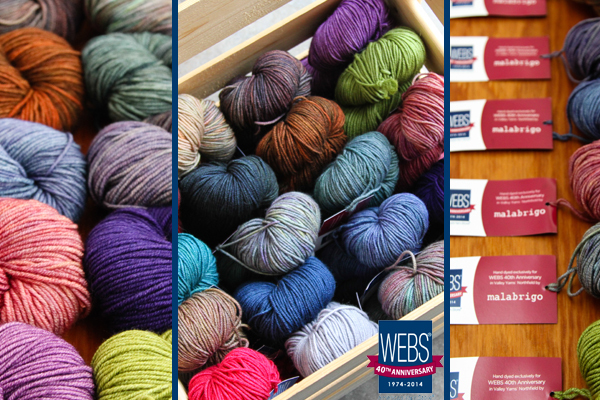 And don’t pass up the incredible prices on Noro Taiyo Lace, Berroco Lago, Cascade Luna Paints and plenty more! What an amazing 40th Year we’ve had! Thank you! We couldn’t have asked for a more amazing year of celebrations, and we’ve finished the year with some of our favorite products and projects! Thank you to Dream in Color! 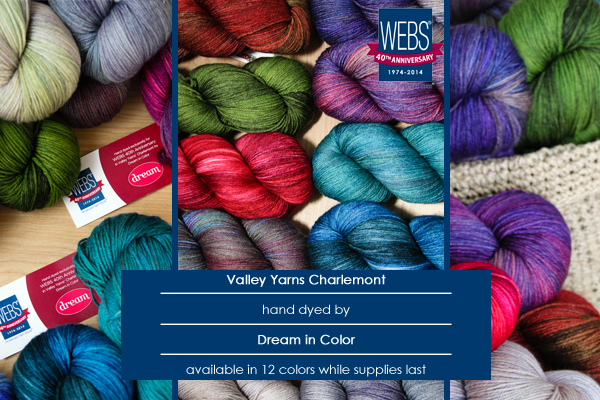 When our Valley Yarns Charlemont in their hand dyed shades arrived we were stunned by how luminous the colors were and you must have been too because there are almost none left! Our thanks to Edie Eckman for the College Park Shawl, and Gudrun Johnston for the Tirrick Shawl, two perfect seasonal layers! 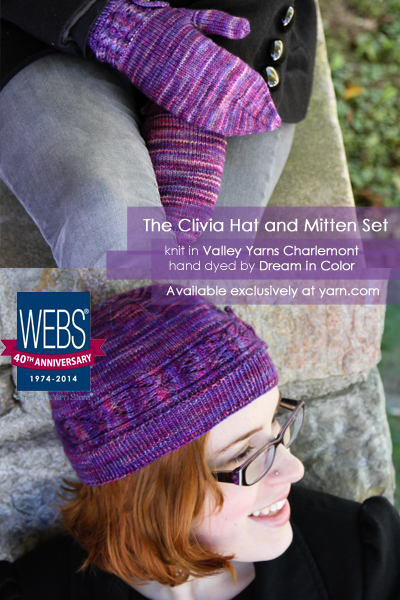 And the adorable Clivia hat and mitt set, one of the few unisex patterns we carry! 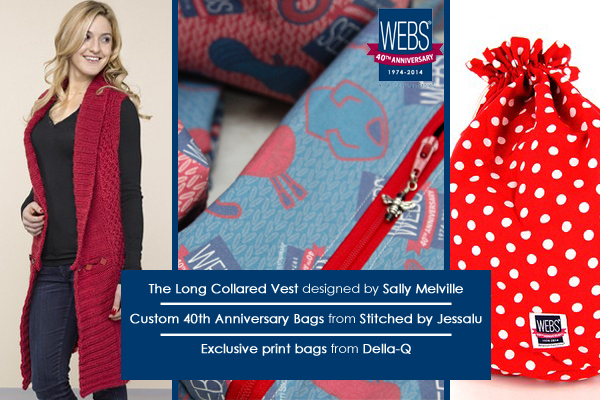 We were honored to have Sally Melville design the Long Collared Vest, and we couldn’t get enough of the project bags from Della Q or the exclusive, custom print bags from Stitched by Jessalu! Thank you! 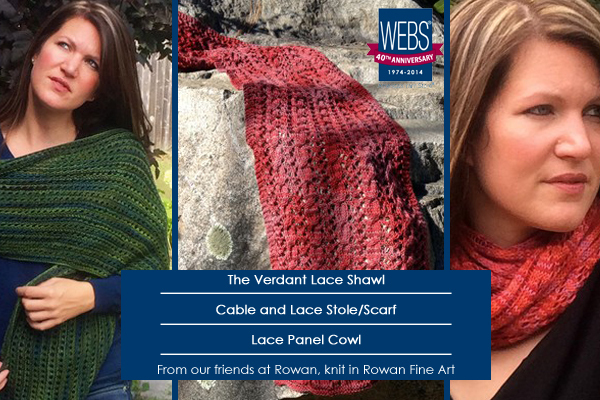 Just when we thought there couldn’t be more to be thankful for our friends at Rowan surprised us with three wonderful designs in Fine Art, the Verdant Lace Shawl, the Cable and Lace Stole/Scarf and the Lace Panel Cowl. And we couldn’t be more thankful for three beautiful weaving drafts to end a year of celebrating a company founded by a weaver and started with the intent of creating weavers. 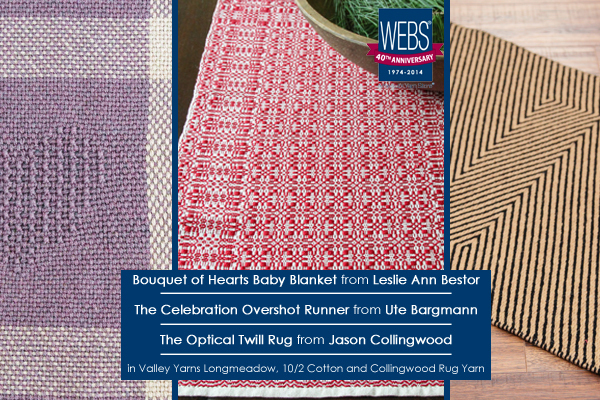 The Bouquet of Hearts Baby Blanket by our own Leslie Ann Bestor, the Celebration Overshot Runner woven by Ute Bargmann and the Optical Twill Rug designed by Jason Collingwood. You can see all the wonderful projects and products we’ve had throughout the year here, here and more here. As an added treat we have a short film about the history of our company for you to enjoy! Thanks for being a part of our first 40 years! 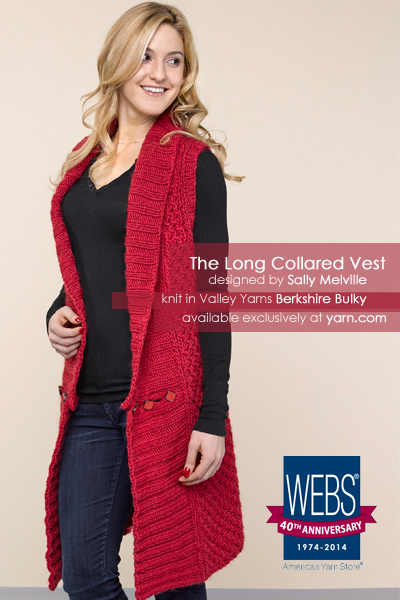 As we approach the end of 2014 we still have a few exciting 40th Anniversary projects to share with you and one of our favorites is the Long Collared Vest by Sally Melville. We were so thrilled when Sally expressed an interest in being part of this year’s celebrations! Working with the Burgundy color of our Berkshire Bulky she has designed a cozy knee length vest that we all wanted to curl up in when it arrived in the office. The large shawl collar hugs you around the shoulders and neck while the textured bodice stitch helps to give the vest structure and visual interest. And just for fun there’s a decorative button band on each side of the ribbing that makes a great place to showcase your favorite decorative buttons. The Long Collared Vest is a great winter knit and the perfect layering piece. With over 3 dozen colors of Berkshire Bulky to choose from which will you cast on with? 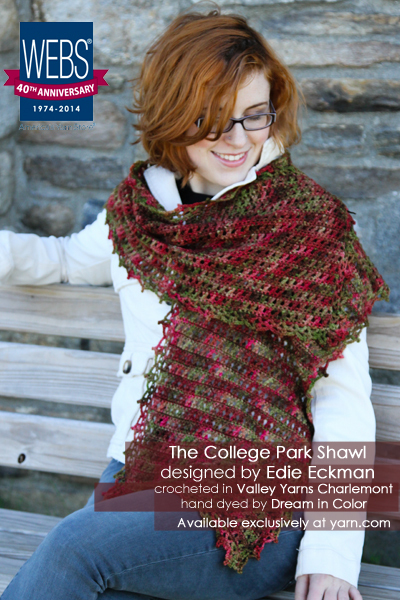 The College Park Shawl from Edie Eckman is a deceptively simple to make, and truly versatile accessory. With just two skeins of our 40th Anniversary Valley Yarns Charlemont hand dyed by Dream in Color you’ll be able to whip up this perfect layering shawl in less than a week! The simple L shape of this crochet shawl means that there’s no actual shaping worked in your stitches! The College Park Shawl can be worn with both ends draped over your shoulders to the front so it looks like a traditional scarf, or with one end tossed casually over your shoulder. 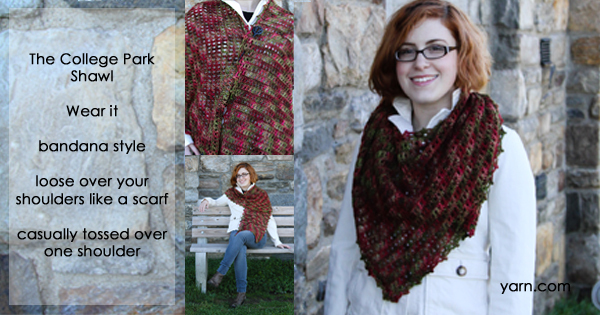 You can also turn the shawl around and wear it bandana style for even more warmth around your neck and shoulders. however you wear it, this is sure to become one of your favorite accessories. 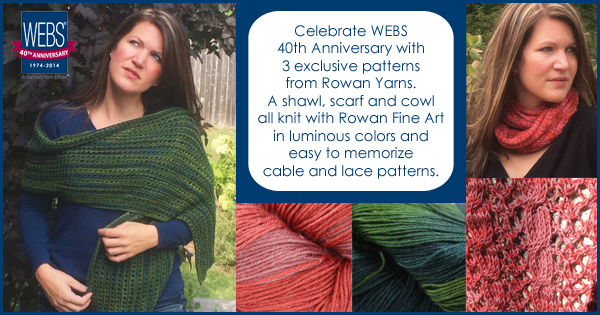 Celebrate WEBS 40th Anniversary with Rowan Yarns! 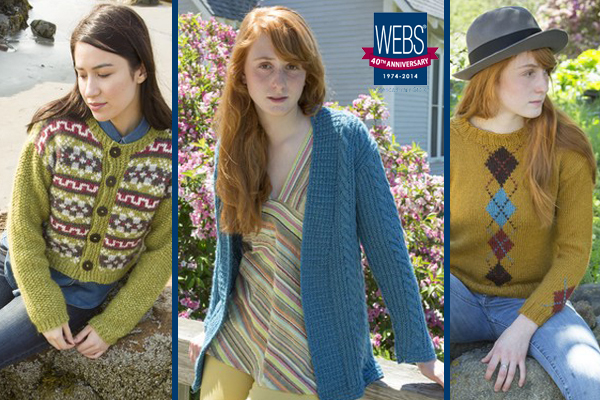 Our friends at Rowan have pulled together three great patterns knit in Rowan Fine Art to help us celebrate this year. The Verdant Lace Shawl is a wonderful wrap knit in a simple eyelet pattern, perfect for keeping you cozy without being too warm. The Lace Panel Cowl is knit flat with a provisional cast on to make it easier to join into a cowl, and with a simple 8-row lace repeat this one will fly off your needles. Finally, the Cable and Lace Scarf has an intriguing stitch pattern that alternates between cables and lace, and can easily be made wider to be worn as a stole. 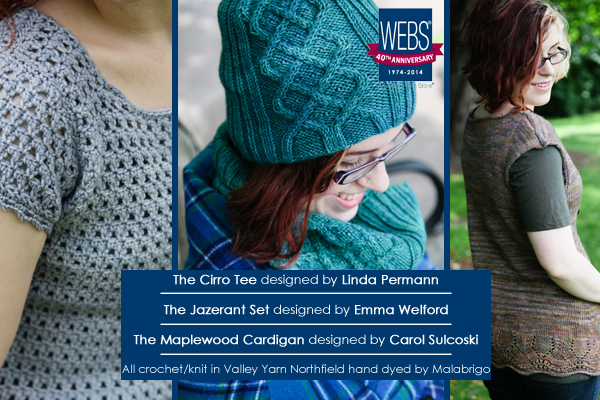 Any of these pattern would make a wonderful and quick Holiday gift or just a little something special for yourself! Which color of Fine Art will you use? Our final Round of 40th Anniversary Celebrations! 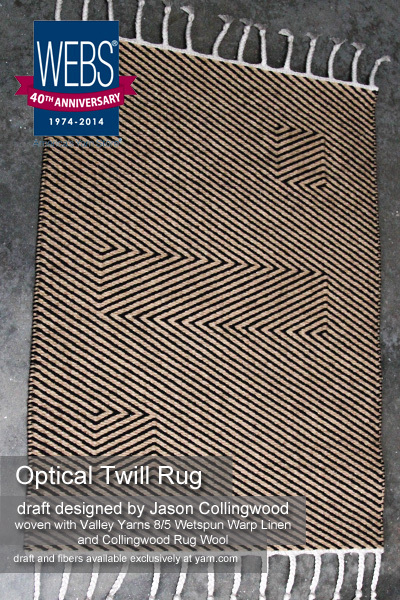 It’s the Fourth Quarter of our 40th Anniversary year and we’re excited to share a whole new batch of products and designs with you. The wonderful team at Dream in Color has worked magic on our Charlemont yarn and we have 12 amazing colors, including an exclusive Ruby colorway! 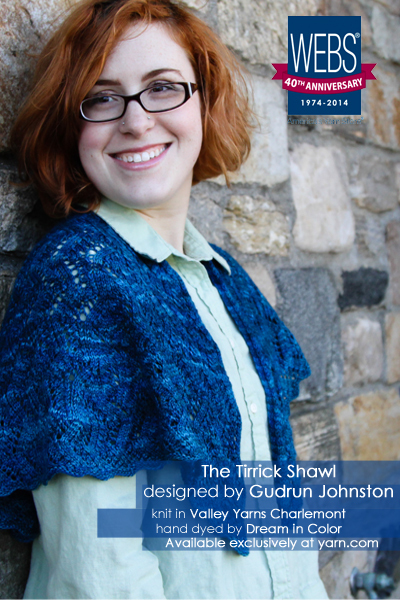 The Tirrick Shawl from Gudrun Johnston is one of her favorite garter-based, shetland patterns worked in an ever decreasing series of wedges that form a soft crescent that hugs your shoulders. 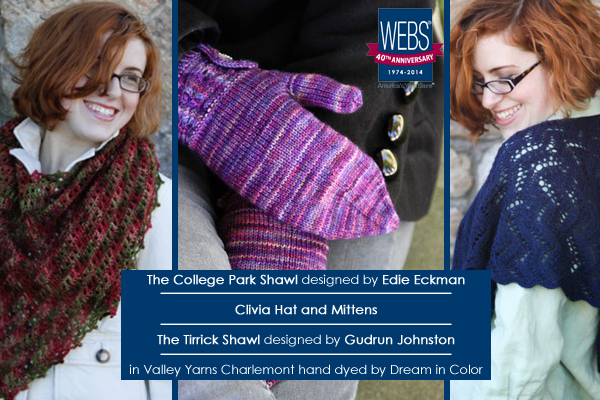 Edie Eckman has designed the College Park Shawl to be one of the most versatile accessories you could have, it works as a shawl, a scarf, a kerchief and more! The Clivia Hat and Mitten Set has fun, decorative buttoned details and the pattern includes a fingerless mitts version. Of course we’ve got another exclusive project bag from Della-Q, there will be three more weaving drafts as well as a few additional patterns and surprises before the end of the year! Be sure to follow us on Facebook, Twitter, Pinterest, Google +, Instagram, or on Ravelry for all the latest. Another amazing quarter of our Anniversary year is almost complete and we have so many special people to thank! Thank you for bringing our yarn to life with your detailed and classically wearable designs. 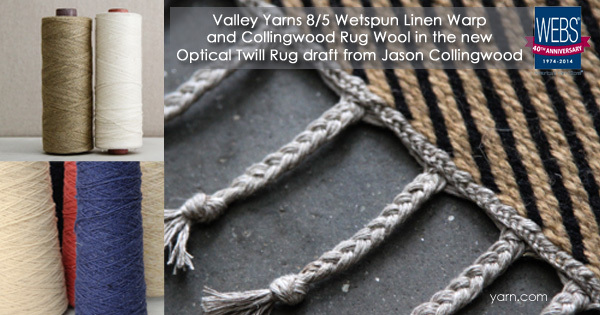 Thanks you for taking one of our already favorite Valley Yarns and imbuing it with your incredible colors. 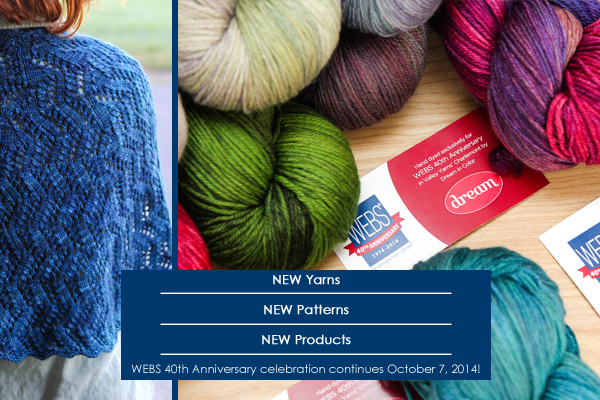 There are still some skeins left, get them while you can! 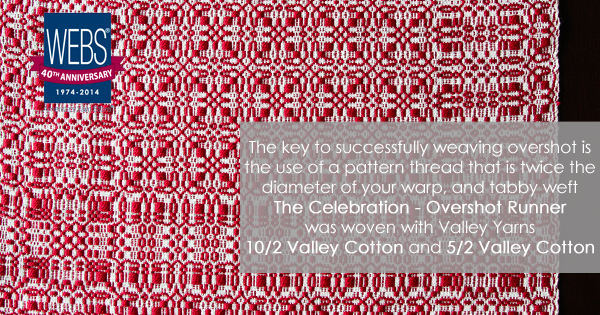 Thank you for stunning designs that bring three more Valley Yarns into our celebrations. 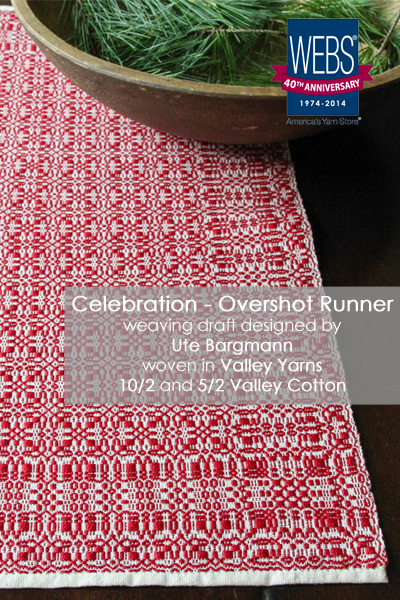 Thank you for creating timeless woven textiles perfect for adorning our homes and expressing our love of the craft. Thank you for a beautiful collection of revamped classics and a lovely new design just for us! Next Tuesday, October 7th, our last round of Anniversary products will be revealed, don’t miss out! 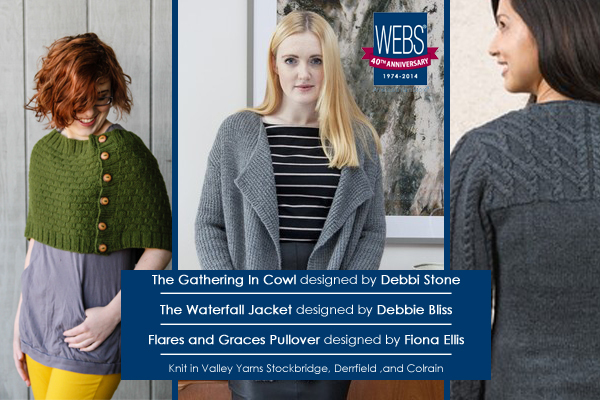 Fiona Ellis is the latest designer to offer one of her beautiful designs in celebration of our 40th Anniversary. 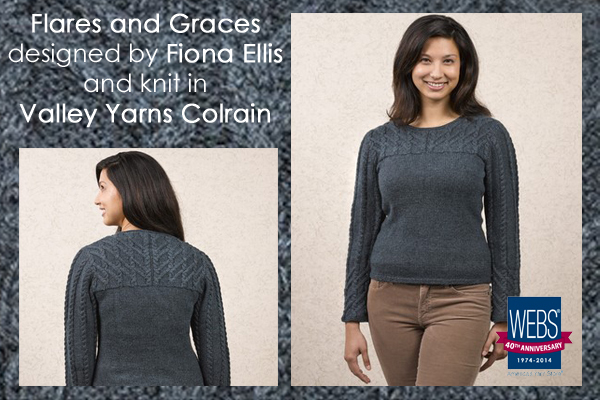 The Flares and Graces sweater features clever chevron cable patterning, designed to highlight the wearers face and hands. Both the slightly flared sleeves and gentle waist shaping gives a slightly fitted silhouette to the body. Set-in sleeves complete the elegant look. Knit in Valley Yarns Colrain, in the new Ocean Heather colorway, the cables really stand out due to the shine from the tencel fiber in the yarn. The remaining merino content gives the yarn a great springiness that helps the sweater feel cozy and soft, even imparting a fine halo effect. This pullover is sure to become a wardrobe go-to sweater that can be dressed up, paired with feminine skirts, or down, with your favorite jeans.